Thirty-seven thousand, four hundred and sixty-one. That’s the number of people killed in motor vehicle crashes in the U.S. during 2016, according to the National Highway Traffic Safety Administration (NHTSA). Each one of those 37,461 people is a spouse, father, mother, sister, or brother who will never return home to their loved ones. Even one fatality is too many, which is why traffic safety experts have been hard at work on rollouts of safe and reliable automated driving systems. Since automated driving technology is still in its infancy, you might be surprised to learn that it actually got its start nearly 100 years ago. In 1925, U.S. Army electrical engineer Francis Houdina equipped a Chandler sedan with a transmitting antenna. With much fanfare, Houdina tested his remote controlled car on Broadway in New York City. The test went well at first, but the car ultimately crashed into another vehicle packed with photographers. Fast-forward to 2013, and automated driving systems have once again captured public imagination. This time, the focus is less on the novelty of the driverless car, and more on the possibility of eliminating traffic fatalities. By 2013, a handful of major automobile manufacturers announced initiatives to create self-driving car technologies. They include General Motors, Ford, Mercedes Benz, and BMW, among others. Self-driving cars are exciting for public safety advocates because most car crashes are caused by driver error, not by unavoidable hazards like hailstorms or black ice. 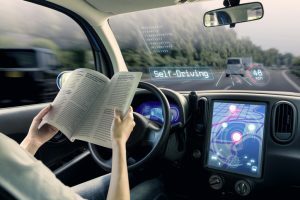 By eliminating the necessity of human control and maneuvering of the vehicle, proponents of automated driving systems hope to substantially reduce the number of accidents. But there’s a long way to go before the technology is ready. The last decade has already seen the implementation of some automated driving systems. By 2010, automakers rolled out advanced safety features like forward collision warnings, lane departure warnings, and blind spot detection. By 2016, late models included rearview video systems, automatic emergency braking, and lane centering assist. Recently, NHTSA and the U.S. Department of Transportation (DOT) issued a Federal Automated Vehicle Policy that outlines voluntary guidance for automakers. By 2025, automakers hope to widely integrate the following automated driving systems into their models: Traffic jam assist, lane keeping assist, adaptive cruise control, and self-park. And beyond 2025, it’s hoped that cars will feature fully automated safety features, including highway autopilot. Not only does this present the possibility of eliminating accidents caused by human error (which is 94% of the total), it offers hope for new independence for disabled individuals and older individuals who can no longer drive. Although improving the safety of the roads is a laudable goal, the current state of traffic safety is still unacceptable. There are countless accidents caused by driver negligence every day across the U.S., including plenty right here in the southern California region. Car wreck lawyers in LA can assist survivors in securing the compensation they deserve to pick up the pieces and move forward with their lives. After an accident, you need an experienced legal advocate on your side. Call the LA car wreck lawyers at Ellis Injury Law. Our law firm in Los Angeles offers complimentary, no-obligation consultations. And there’s never a legal fee unless we secure money on your behalf.